Happy Feast of St. Clare! The following prose-poetry is dedicated to her. Now I am back in Wisconsin resisting (partly) a necessary reset of my mind after an experience among a community of creative Christians at The Glen Workshop: I am trying to write an academic paper while poetry in my memory and future propel me backward and forward–as the language of academia conflicts with what my soul desires. This tension is a bit like the thunderstorms that clouds can create; the electricity of the different parts of my mind can also create downpours. In the silver machine of mystery (the car, so it is to me) I listened to phenomenal podcasts as I made my way over horizons and toward my home. The words of poets, scientists and journalists multiplied my awe for the beauty and complexity of God’s creation, of this world made so multidimensional by the way we humans interact with God’s doings and pretty much make messes all over the place. I was completely blown away when I heard Paulo Coelho speak about his journey into becoming a writer. I was inspired by how Naomi Shihab Nye overturns the poetry found in ordinary life. I was flabbergasted by the scientific discoveries being made about the intelligence of the forest. And, I was horrified by the reality of what life is like for refugees in Greece nowadays. In each story told, the true wildness of who God made us to be and who we are was exposed: we are one, the body of Christ revealed by way of loving, enfleshed in service and creativity. 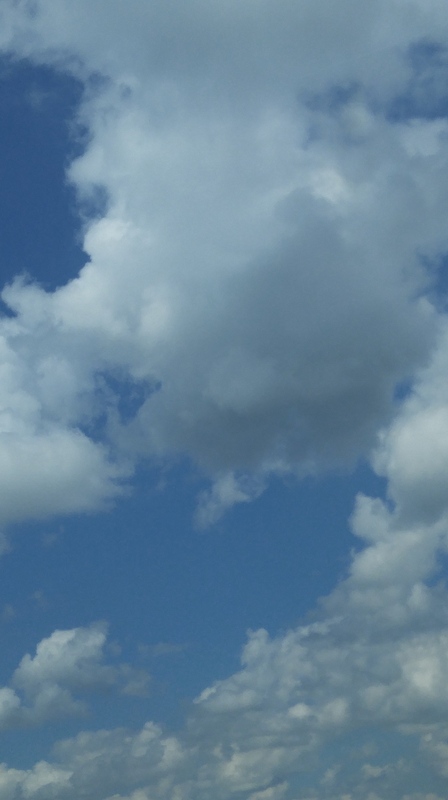 Across the expansive sky I saw diamonds and other mysterious shapes made from clouds. I saw hearts form, widen, evolve. Over rolling plains of farmland, human stories sort-of hugged me in the car container from all sides; tales of tough Truth and invitations to participate in God’s goodness came at me in surround sound. I gasped and grinned for the beauty of the images combined with Truth made into sounds, for the swirling mess of life and beauty enfleshed everywhere. Hands on steering wheel, mind awake, foot on pedal, eyes wide open, heart expanding. Through God, in God, and by God the clouds moved. And so did I. So did all of us, as one. Alleluia for the sunset each day. Alleluia for sniffing wilted lilac blossoms. Alleluia for pauses in the rushed, packed scheduled life. an unexpected “thank you” from a tired teen. Now we are in ordinary time. Have you ever felt like someone was ignoring you? As if, although you have a history of friendly relationship with someone, they no longer recognize you as different from any other stranger in a crowd? That, even despite your efforts to greet them with love and reconcile the relationship, they chose to snub you and turn away? Recently, I had this experience and it really hurt. I talked to some of my close companions about what happened and they encouraged me to not take it personally. Then, I prayed and pondered the love of God in light of what had happened. My prayer led me to an insight: God, in a way, can relate to my experience of feeling ignored. We rush around preoccupied with our agendas and desires while God dazzles us with beauty. How often does God reach out to us with amazing expressions of love that we totally ignore? We turn away when God is aiming to awe us; when God is ready to stun us into a moment of transcendence, praise and prayer. God tries, over and over, to get our attention and dazzle us, so that we remain faithful in our habits of keeping God #1. God wants to be close to us. Yet, we turn away and ignore God’s love. Fortunately, God’s love and patience is abundant! And, even when we are blind or miss a clue or just plainly ignore God’s beauty, God is OK with reaching out to us again, in another way. God of amazing love, have mercy on us and help us to grow in relationship with you. As we pay attention to your wonders, may we lift our hearts in praise. You are awesome and your creation is beautiful. We want to be closer to you and we are grateful for your love. Amen! Worldwide Franciscans like me are celebrating the founder of our order today. On the eve of this day, in 1226 St. Francis of Assisi died and went to heaven. Last night we celebrated the Transits to memorialize this sacred story. Today we remember and honor St. Francis’ story and contributions to the Church. Through his witness 800 years ago, we have all be transformed and inspired. In his honor and in celebration of this happy day, I wanted to share some St. Francis of Assisi photos from my pilgrimage to Italy in 2014. Happy St. Francis Day everyone!!! Today is the World Day of Prayer for Creation! This is an ecumenical and global day of prayer. World-wide, Christians are united in prayer for the healing of this sacred home and our Sister, Mother Earth. Out of love for her, we pray in hope and thanksgiving. Here in La Crosse, Wisconsin we are keeping vigil round the clock in our perpetual adoration chapel. Father, we praise you with all your creatures. they are yours, filled with your presence and your tender love. through you all things were made. and you gazed upon this world with human eyes. and accompany creation as it groans in travail. and you inspire us to do what is good. for all things speak of you. for every being that you have made. for not one of them is forgotten in your sight. and care for this world in which we live. The poor and the earth are crying out. of justice, peace, love and beauty. We pray in joy and wonder. We pray that we can be better stewards of the gifts that God has given us. We pray that we will have the graces and courage to be in right relationship with all of creation. May God help us all to integrate the important and challenging teachings contained within Laudato Si into our daily lives. Like many thousands of Christian millenials, I have been interested in The Simple Way community ever since I first devoured this book about eight years ago. 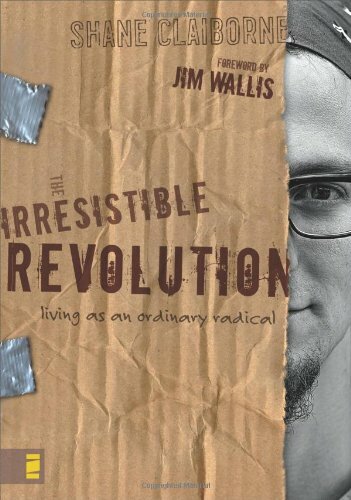 In The Irresistible Revolution: Living as an Ordinary Radical, Shane Claiborne describes an inspiring type of Christian living: a dedicated, communal, prayerful, life of radical simplicity and activism inflamed and inspired by the Gospel. Some time after first reading his book I remember writing Shane Claiborne a letter thanking him for his work and sharing with him how it impacted me. At the time I was new to my Franciscan community and feeling confused while I discerned commitment. I was starting to become aware of the community’s shadow sides as my idealized sense of who we are waned away. I felt uncertain whether staying with my Franciscan community would free to me to live the way I felt called to live. Plus, I was struggling with generational challenges and the impact of joining a group with a long history. Honestly, I was tempted to leave religious life and instead join a movement with the freshness and ecumenical energy like The Simple Way community that Shane describes in his book. Since that first correspondence, I have remained a fan and follower of Shane Claiborne and The Simple Way. I have heard Shane speak in person a couple of times and I continue to be inspired and influenced by his writing and passion for being a neighbor and disciple of Jesus. I have tried to keep up with all the happenings in The Simple Way, but never before made it there for a visit. So when a wedding brought me to Philadelphia at the end of June, I reached out to The Simple Way community to see if I could stop by. I didn’t expect to actually see or spend any time with Shane (he’s kind-of famous) but I was really interested in the current state of The Simple Way and how God was working with and through their presence in the Kensington neighborhood. I was so excited when I found The Simple Way in Philadelphia! I really felt like I was arriving on Holy Ground, a place of faith and wonder. There, I was hosted by Caz Tod-Pearson (the director of the organization) who had recently returned from maternity leave. She and I had a deep conversation about The Simple Way story. She told me about the ups and downs of community life and the ways that she is working hard to help the community stay rooted and find a healthy focus. “Right now we do not have an intentional community house, or a large amount of service projects, or programs going on as we have in the past (as the stories in the book written 10 years ago speak of). Over the past year and a half we’ve gone through some major transition, and taken a lot of logs off our fire, that had got pretty saturated, to get the flame burning again. So what happens here on a weekly basis is pretty small and simple, and has begun to look a little different as indigenous neighbors take on more leadership and volunteer roles in the work that had been done by our residents. We’ve had to say no to a lot of good people wanting to come in and help as we’ve listened and made way for neighborhood leaders to take ownership for what our neighbors need and want. I love the simple beauty of the main common room where we had our conversation. Caz spoke about how fame and fire impacted The Simple Way community. In 2006 The Irresistible Revolution and The Simple Way community was put into the national spotlight. During that time Krista Tippet interviewed Shane on Speaking of Faith (now On Being). Then, on June 20, 2007, a seven-alarm fire destroyed several properties in Kensington, including the house where Shane was living. The effect of these two events occurring so close together was an explosion of financial support, organization, projects, collaborations, associations, press and visitors. The initial grass-roots, intentional-community flavor of The Simple Way shifted some. It is still an intentional community, but it’s not of the same type as when it was founded. The Simple Way has essentially remained in a state of discernment and transition since 2007, while still serving the neighborhood and being faithful to the Gospel. Here is the lot that remains empty since the fire. The Simple Way is now committed to being a loving presence in Kensington, building relationships of mutuality and establishing sustainability. And in a place hurting from poverty and its impacts, they offer tremendous beauty and love to the neighborhood by cleaning up spaces and sponsoring artists who paint murals. They also have a few garden projects. What I encountered during my visit to The Simple Way was inspiring and exciting for God clearly is actively influencing the life of community. What was especially fascinating, though, were the indicators that the members of this new form of religious life are dealing with similar questions as those of us who are newer to Catholic religious life. In different corners of the country, living different forms of religious life, we all seem to be riding the same wind that the Spirit is blowing throughout God’s people who are eager to build God’s reign of peace and justice. Just like the peers of my generation in Catholic sisterhood, The Simple Way is grappling with questions of identity and call and how to respond to the signs of these times. They are trying to discern who God needs them to be now, as they stay open to the Spirit’s work and revere the legacy of their founders. They are trying to establish relationships of mutuality with those on the margins of society and build bridges across lines of culture, class and creed (and I have also heard some of my Catholic Worker friends of my generation express the same sort of desires). Clearly, God is up to many great things through Shane and Caz and their friends and neighbors, who are working hard to help Christ’s peace and love be known in our hurting and troubled world. Thanks be to God for how they offer themselves as true instruments of peace. Let us pray for them and support them in all the ways we are able. They—like many other Christian millenials—are challenged by the Spirit and the signs of these times. We desire to help God’s peace and justice be known by all people, in every broken place of the world. No matter what type of Christian community we belong to and whether we are joining a new movement of the Spirit or a 800-year-old tradition, all of us are eager to build deep relationships of mutuality and strong communities. Together we are on this journey of building hope and proclaiming peace. So, let’s pray, discern and follow the Spirit together, now matter how messy, mysterious or confusing doing God’s good work may be! AMEN! to the way of these loons. were designed to be best. The gaps are quickly filling in between the branches as more and more leaves open up each day. As more leaves open and crowd the trees with bright color I am reminded how we are also like small leaves–alone, we are vulnerable and hopeful. Together we are strong and form a bold, bright, colorful community. We must not stay attached to any certain way-of-being. We must be open to growth, to change and conversion. The leaves, like Jesus, teach me great lessons. Through their example I see how to give of myself for the sake of others. I learn how to give into growth for the sake of love. May we all remain open to the growth and sacrifice that God calls us to for the sake of others. Amen! 179,547 readers since November 29, 2010. Praise God, thank you!